Where to go when your parents come to visit New York City? Contributing editor Juliana Jaoudi has practical ideas to ensure a fun visit for both generations. NEW YORK CITY – My wanderlust is Donna's fault. Donna is my mom. Together we've been to Morocco, Lebanon, Liberia, London, Paris, the Côte d'Azur, the entire west coast of Turkey, Egypt, and Mexico. All this before I was 21. Donna travels for the photos. In her heyday, she'd go anywhere and take the most beautiful photos. She has a way with people, pink skies, textured and dilapidated stuff for black and whites, kids, and old people. The fallout from all this visual stimulation? Every few years, I need to move. San Diego, Paris, DC, Boston, Paris, LA, and now New York. My mother doesn't mind my itinerant ways. A new city means new photos. Donna, who is now in her 70s, recently spent a long weekend with me in New York with her best friend, Terrie, and Terrie's daughter, Scarlet. Donna hadn't been to NYC in twenty years and Terrie in 50. I was worried about the walking, the heat, the noise, the smell, the too much. It's a tough city, and old broads tire easily. But Scarlet and I devised an excellent and very doable parental itinerary. The ladies stayed at the best kept secret in town, the Desmund Tutu Center. Lovely West Chelsea location near the river, the High Line, and my apartment. Perfectly quiet. Big gorgeous rooms. We dove into NYC. Meatpacking District. Dinner outside at Pastis for the energy and the people watching. Scarlet and I had to work, so we sent them to Cookshop for brunch. We wanted to let them explore on their own and push their limits while energy levels and motivation were high. They walked the High Line, then hopped a cab to Ground Zero. Exhausted, they returned to their neighborhood for a late lunch at Chelsea Market. After a quick rest, we went to Book of Mormon, which was worth every penny of the overpriced broker's fee. Two Alleve each for their sore bones, plus a leisurely breakfast of croissants and coffee from La Bergamote Patisserie. We debated where to go next, because everyone needs some spontaneity. While the Tenement Museum on the Lower East Side almost made the cut, we decided on the Metropolitan Museum of Art and went straight to the rooftop for gorgeous city views and a rest on the benches. We took in various exhibits and caught up with Donna in the gift shop. Carriage ride through Central Park, followed by tea at The Plaza. Yes, touristy. Whatever: They loved it. Another quick rest, then dinner in Tribeca at Locanda Verde. We let them sleep in, then went for a mid-morning stroll through Union Square and the Greenmarket. We had a delicious lunch at Blue Water Grill, which you forget about but really is a striking room. On our way to the theater, we asked the cab driver to take us through Tudor City for a glimpse of the UN, then to Times Square for the matinee showing of Jerusalem. (The goal was to do even less walking on day three.) That night, we did one last push: the East Village. Donna found it a very fruitful photo op. We had modern Greek dinner at Pylos (something new) and capped it off with traditional Italian pastries at Veniero's (something old). Early morning flight back to the West Coast. The girls were still basking in the glow of the city when Donna called to tell me she had arrived home. 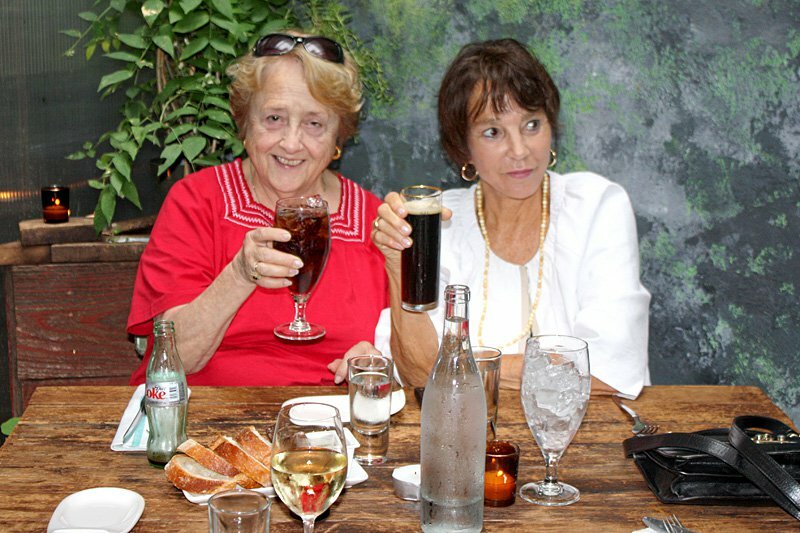 The old broads had lived like girls and relished every minute of it. - Have a car service pick them up at the airport. Not that much more money, but much, much nicer. - Prepare a welcome kit: umbrella, hand sanitizer (NYC is dirty), Band-aids for walking blisters, hand lotion, a lint brush, Kleenex, a pack of gum. - Avoid SoHo and the West Village. Too much walking, too many people. - Buy museum tickets online to avoid extra waiting and standing. - While we may love the subway, parents don't. Stick with cabs. - Splurge on theater tickets. Book restaurants way ahead of time. When you think they can't walk the extra block, just walk ahead of them. They'll make it. - Figure out before they arrive where the closest 24-hour pharmacy is located. They are senior citizens after all.